Milli is 1 and a quarter years old. And she’s gained some big new skills in the last month. She’s walking everywhere. And she’s learned to climb the stairs. That means a 2nd gate in the house. We only had one at the top of our basement steps when she started crawling. We obviously didn’t want her falling down them. But now that she’s climbing, that means we will have to add a gate so that she can’t climb up the stairs to our bedroom. The gate we use is this fabulous auto close gate from Munchkin. Having a gate that closes itself is a lifesaver for me. This is particularly nice when I’m carrying groceries down to our pantry in the basement, or now when I’m bringing laundry back upstairs. …Now if I could just figure out how to keep her from trying to climb into the tub. But back to Mil — she’s also gotten to do quite a bit of outside playing in the last month. She has her own water table and a kiddie pool at home, plus we’ve been to swim and play at the grandparents’ houses. #MildredJane enjoyed her #watertable this weekend. She is also spending lots of time outside watching the baby ducks and Bubba the cow. Mil has even learned to say Bubba’s name (which might be bad because Bubba is very close to becoming dinner.) We’ll have to get some more cattle at the house soon. #MildredJane and I got to test out the new yard swing this weekend. Mil approves. 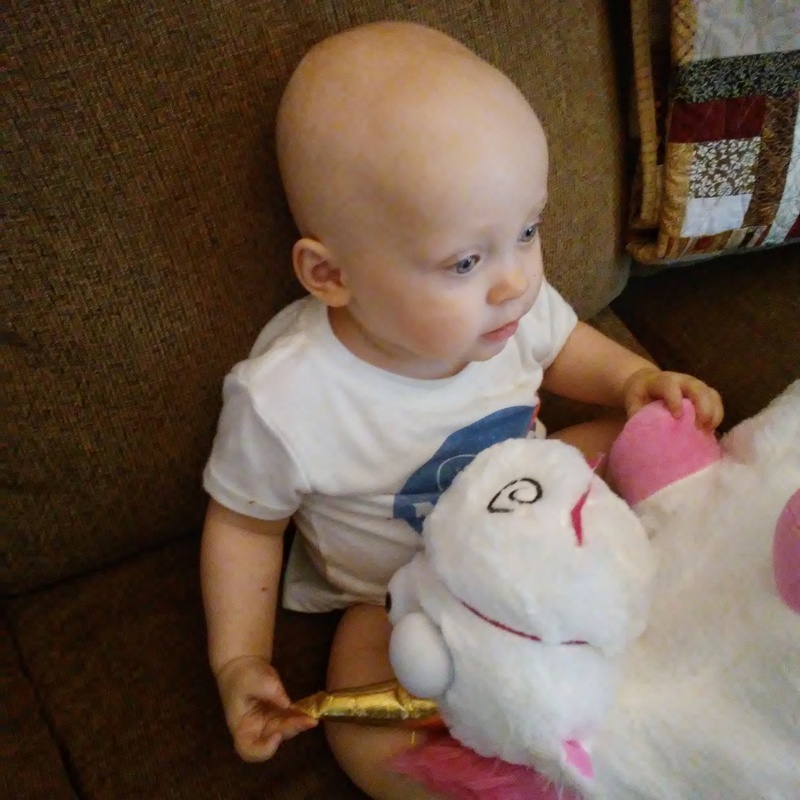 When Mil does have to spend time inside, she likes sit with mom and watch the Despicable Me movies (she has her own fluffy unicorn! ), or the Puppy Dog Pals. So that’s what’s up with Mil right now. What’s going on in your life? Pantry in the basement? Why, may I ask. Unless your kitchen is also in the basement, that means a lot of carrying stuff up and down. If you don’t enjoy cooking, this could be part of the reason. Mind you, I don’t even have a basement, or a storage space. The apartment’s only 675 sq feet. The pantry doesn’t have our day-to-day food provisions in it. It’s storage for extras. I am lucky to be able to afford and have the space to keep extra items in the house. That way I can buy half a dozen cans of cream of mushroom soup when it’s on sale. Then when I run out of something in the kitchen, I can go shopping in my pantry and save a trip to the store. I should also mention that I do can some of my own produce, so the pantry ends up with copious amounts of homemade pickles and jellies which we give for gifts at Christmas. Wow! She’s getting so big! Once they get mobile… She still has the most beautiful eyes ever. Aw thanks! I’ll make sure to tell her. I’m avoiding thinking about all of the things that she’ll be getting into soon.